When considering Europe’s hottest tech hubs, you often think about London, Berlin and Amsterdam. However, during the most recent years, a new player has been quickly developing its entrepreneurial base and potential. Denmark, the hygge-filled country considered to be one of the world’s happiest places to live, has been steadily growing its technological capabilities. The Danish government has encouraged its impressive talent base to engage with country’s growing tech scene – a strategy that has already borne fruits for the economy. We’ve spoken with Daniel Sørensen, the Co-Founder and Creative Director at Sleeknote, one of Denmark’s great examples of how a supportive working culture helps create fast-growing companies. We’ve talked with Daniel about his business, experiences as an entrepreneur, and plans for the future. 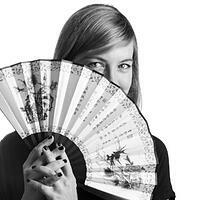 Karolina Kurstak: What is your business about? Daniel Sørensen: Sleeknote is an engagement tool for e-commerce businesses. It's a tool that lets you create non-intrusive and personalized on-site messages. Sleeknote is highly efficient when it comes to generating leads, increasing sales and promoting products. If you could describe Sleeknote in three adjectives, what would you choose and why? Daniel: I would say agile, focused and goal-oriented. We always focus on our customers’ needs, and that resonates in everything that we do. All our product planning is centered around the customer. We try to focus specifically on e-commerce businesses in order to narrow it down and make sure we are addressing the specific needs of our clients. But it’s not only that. Our values resonate throughout the entire company. Whenever we hire a new team member, we don't necessarily put him or her into the same role throughout their entire period here. We make our best to provide them with their preferred options. How did you come up with the idea for Sleeknote? Daniel: We actually started off as two companies – we were two small startups with the same idea. A lot of what we’re doing now is related to the problems I was facing during my previous professional experiences. I used to work in an e-commerce agency. A lot of the development that we did was focused around on-site messaging. Many of those functionalities were re-used on several projects, however, it was quite time-consuming to make them really personalised and relevant for different businesses – they were quite basic. At the same time my co-founder, Emil, was on the other side of the table. He was working as an e-commerce manager and felt the pain of having to reach out to an agency every time he wanted to change the context of his marketing tools. My other co-founder, Mogens, worked as a consultant for a number of online stores, and he, on the other hand, felt the need of creating a tool that would enable the collection of more email subscribers. One day we crossed paths, and found out that our visions aligned really well. We didn't want to fight within Denmark’s small ecosystem. We didn't want to compete against each other, waste time, energy and resources. We saw a bigger opportunity in joining forces – we wanted to attract bigger clients in bigger markets. And that’s how today’s Sleeknote started. How does Sleeknote differentiate itself from other players on the market? Daniel: We differentiate ourselves from the competition by being keenly focused on e-commerce businesses. In a field like ours, there's a big difference between, let's say, a regular website and an e-commerce site. The goals are very different. We try to focus on e-commerce because that's where we see our tool bringing the most value. London is known to be Europe’s most thriving startup scene. Berlin is quickly catching up. How does Denmark compare? Daniel: For me, it seemed that Denmark was a bit slow on catching up on the startup scene or fostering the ecosystem of funding. But in recent years, there's been a very positive development, both in terms of entrepreneurship and funding. The government started taking different initiatives on the subject. For example, they started educating entrepreneurship in schools. New funding opportunities were created. There is a flourishing startup scene in Copenhagen, but also here in Aarhus and other bigger cities. You previously mentioned something really interesting: the fact that you and your colleagues decided to join forces in business and go big, instead of competing for a smaller market. Does this kind of approach have roots in the Danish working culture? Daniel: There is a very friendly relationship between startup companies here. We know we're in a smaller country. We know it takes a lot of effort to actually make it. So we tend to help out each other in any way we can. We spend a lot of time and resources on developing the right working culture, because we believe it is the fundamental thing for any startup. What about your company’s culture? Daniel: Being a small company, you know that you don't have the funds and resources to give these really elaborated benefits to attract talented people. So it's more about creating the right atmosphere – an atmosphere that fosters both good relationships and education. We help our employees grow and we make sure they know that the work they're doing matters. If you don't have a million layers of management, you are right there. Basically, your work gets shipped, and you are responsible for it. And when it’s done, you get credit for it. How do you develop software in Denmark? Daniel: For a long time, at least from my perspective, outsourcing your development had a really, really bad reputation. Usually, it meant you would hire people from some underdeveloped countries, and you would get exactly what you described in your plan – no more, no less. That meant you would have to think out every single piece of the development before you even started. But I do feel though, that's a sort of a tag I got from working at an agency – they never outsource any development work. My view and perception about this shifted, as I founded my own startup. There are a lot of Danish companies that advocate augmenting your team – meaning that you get a company like Netguru, where you actually don't outsource anything, you collaborate. And that's the right approach, in my opinion. What were your motives for choosing a Polish remote company? Daniel: Me reaching out to Netguru originated from the need of hiring a designer. I was scoping Dribbble accounts, seeing what type of design work inspired me. I was figuring out what kind of design style aligned with ours and where we wanted to be. I stumbled upon your guys' work – I hadn't considered an agency or consultancy in any way, but I really, really liked the work that you guys did. So, I thought, well, let's test it out, see how it works. Whether you were at an office in Poland or spread out across the country, it didn't matter to us. What was it like to work with Netguru? 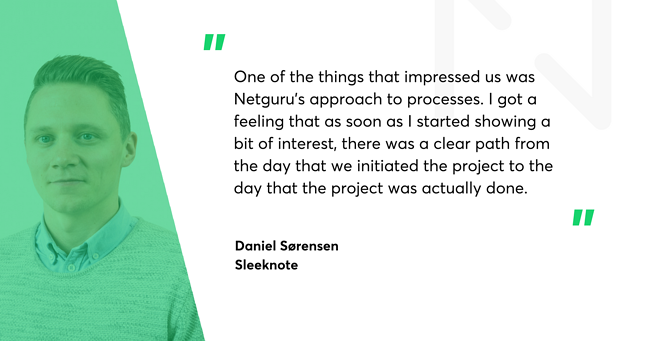 Daniel: One of the things that impressed us was Netguru’s approach to processes. I got a feeling that as soon as I started showing a bit of interest, there was a clear path from the day that we initiated the project to the day that the project was actually done. And even though the project was done, the communication line wasn't cut. There was a constant follow up, a constant tending to the needs and possible future collaborations. That was and is really impressive. Daniel: We spent this entire year exploring our marketing reach and figuring out the best way to grow our clients base through inbound marketing. We got the results back and now have some numbers we can start working on. This means the future is going to be very much focused on the product and our client base. We feel like we have a really good understanding of our customers' needs and the way we get in touch with them. Now we need to start scaling their numbers. We feel like we are ready for it. Daniel: I would say that it's not something that we're completely decided upon, but I think we'll be aiming at the Nordic countries. We see a lot of growth in Norway. Sweden is also starting to catch up. But, of course, we are also trying out new markets like Germany – we have an expo in Berlin at the beginning of 2018. It will be pretty interesting to see how that turns out.